Hancock is a town in Washington County, Maryland, United States. The population was 1,546 at the 2010 census. 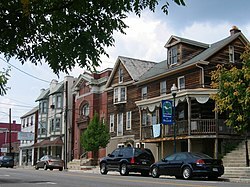 The Western Maryland community is notable for being located at the narrowest part of the state. The north-south distance from the Pennsylvania state line to the West Virginia state line is only 1.8 miles (2.9 km) at Hancock. Hancock is located at 39°42′7″N 78°10′51″W﻿ / ﻿39.70194°N 78.18083°W﻿ / 39.70194; -78.18083. According to the United States Census Bureau, the town has a total area of 2.75 square miles (7.12 km2), of which, 2.73 square miles (7.07 km2) is land and 0.02 square miles (0.05 km2) is water. The state of Maryland narrows to a width of less than two miles (3 km) in the Hancock area—the smallest non-vertex border-to-border distance of any U.S. state. It is at the junction of Interstates 68 and 70. The Chesapeake & Ohio Canal passes through the town, and the Western Maryland Rail Trail connects Hancock with Fort Frederick State Park. The climate in this area is characterized by hot, humid summers and generally mild to cool winters. According to the Köppen Climate Classification system, Hancock has a humid subtropical climate, abbreviated "Cfa" on climate maps. As of the census of 2010, there were 1,545 people, 694 households, and 407 families residing in the town. The population density was 565.9 inhabitants per square mile (218.5/km2). There were 821 housing units at an average density of 300.7 per square mile (116.1/km2). The racial makeup of the town was 97.7% White, 0.4% African American, 0.5% Native American, 0.4% Asian, and 1.0% from two or more races. Hispanic or Latino of any race were 0.5% of the population. There were 694 households of which 28.5% had children under the age of 18 living with them, 37.6% were married couples living together, 15.1% had a female householder with no husband present, 5.9% had a male householder with no wife present, and 41.4% were non-families. 36.7% of all households were made up of individuals and 14.3% had someone living alone who was 65 years of age or older. The average household size was 2.23 and the average family size was 2.86. The median age in the town was 40.7 years. 22.4% of residents were under the age of 18; 8.8% were between the ages of 18 and 24; 23.5% were from 25 to 44; 27.6% were from 45 to 64; and 17.9% were 65 years of age or older. The gender makeup of the town was 47.7% male and 52.3% female. As of the census of 2000, there were 1,725 people, 735 households, and 462 families residing in the town. The population density was 637.8 people per square mile (246.7/km²). There were 803 housing units at an average density of 296.9 per square mile (114.8/km²). The racial makeup of the town was 98.26% White, 0.35% African American, 0.35% Native American, 0.06% Asian, 0.12% Pacific Islander, 0.12% from other races, and 0.75% from two or more races. Hispanic or Latino of any race were 0.46% of the population. There were 735 households out of which 27.6% had children under the age of 18 living with them, 41.8% were married couples living together, 16.3% had a female householder with no husband present, and 37.1% were non-families. 31.2% of all households were made up of individuals and 15.8% had someone living alone who was 65 years of age or older. The average household size was 2.30 and the average family size was 2.86. In the town, the population was spread out with 24.5% under the age of 18, 9.5% from 18 to 24, 28.2% from 25 to 44, 21.9% from 45 to 64, and 15.8% who were 65 years of age or older. The median age was 36 years. For every 100 females, there were 88.3 males. For every 100 females age 18 and over, there were 80.8 males. The median income for a household in the town was $28,750, and the median income for a family was $32,538. Males had a median income of $25,353 versus $20,304 for females. The per capita income for the town was $13,758. About 11.6% of families and 16.8% of the population were below the poverty line, including 19.7% of those under age 18 and 13.7% of those age 65 or over. Central Hancock and Maryland Route 144 (Main Street) as seen from the U.S. Route 522 bridge. The town government consists of five elected officials: a Mayor and four members of the Town Council. Council members are elected to four-year terms while the Mayor is elected to a two-year term. Hancock is one of the smallest municipalities in the state of Maryland. Ike Powers – a professional baseball player who played two seasons for the Philadelphia Athletics from 1927 through 1928. Charles H. Rowland – a Republican member of the U.S. House of Representatives from Pennsylvania. Richard K. Sutherland – U.S. Army Lieutenant general, who served as a general Douglas MacArthur's Chief of Staff during World War II. ^ "Hancock". Maryland Manual. Retrieved 27 June 2017. ^ "US Gazetteer files 2010". United States Census Bureau. Retrieved 2013-01-25. ^ "Hancock, Maryland Köppen Climate Classification (Weatherbase)". Weatherbase. Retrieved 19 April 2018. ^ "Intellicast - Hancock Historic Weather Averages in Maryland (21750)". www.intellicast.com. Retrieved 19 April 2018. Wikimedia Commons has media related to Hancock, Maryland.